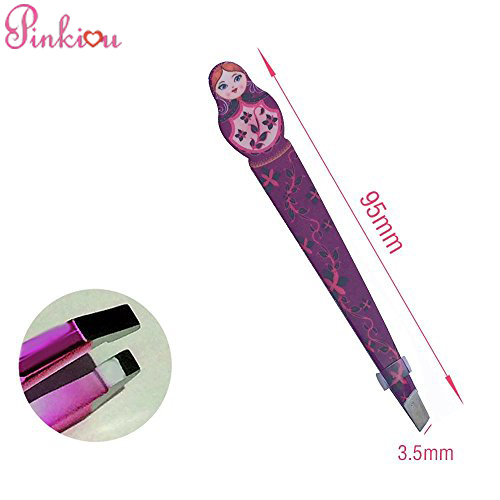 Pinkiou- The Professional Airbrush Permanent Tattoo Makeup Brand / Personal Care / How to use Pinkiou Eyebrow Tweezers Pluck Your Eyebrows? How to use Pinkiou Eyebrow Tweezers Pluck Your Eyebrows? Are you worried about plucking your eyebrows? You’ll feel a little pinch, but using the right technique will minimize the pain. Learn how to pluck and shape your brows like a professional. Get a good pair of tweezers. Use fine-tipped, clean tweezers to do the job. If the tweezers you use are too blunt or unwieldy, the process of plucking can take much longer and cause unnecessary pain. You need to be able to firmly grasp individual hairs and pull them out smoothly. 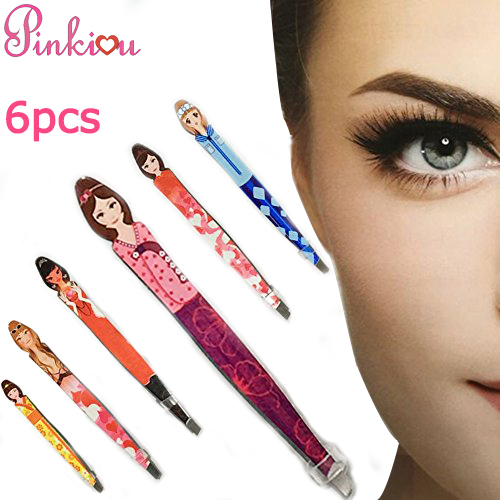 Pinkiou Eyebrow Tweezers made with professional technigue, contains five different lovely style, believe you will get your love here. Plan to pluck your brows right after you take a shower. The warm water and steam will have left your skin moist and supple. Identify the direction in which your eyebrow hair grows. For most people, the hair grows outward from the nose toward the hairline. In some cases, people’s brows have hairs growing in more than one direction. Take careful note, because you’ll want to pull the hairs in the direction of their growth when you pluck; this helps them come out cleanly. Hold a pair of tweezers in your hand like you would a pencil. The open end should be up. Give it a few squeezes so you’re comfortable with the motion you will need to use to pluck your brows. If you need to stop and take some breaks, that’s ok. Resume plucking when you’re ready. Sometimes plucking eyebrows causes the eyes to tear up and the nose to itch. That’s perfectly normal; just keep going until you’re finished. Identify the place where your brows should begin. This is different for every face, but the same technique may be used to find anyone’s brow line. Take an eyebrow pencil or another long instrument and line it up from inner corner of your eye to the edge of your nose. Use a white pencil to make a dot above the spot where it crosses your eyebrow. This is where your brow should begin. Repeat with the other nostril. Make sure the instrument you use to find your brow’s starting place is very thin. If you use something thick, it will slightly throw off where you place the dot. The space between your brows and your eyes. If your brows are set high on your forehead, you may want to go with heavier brows to help frame your eyes. If you have a low-set browbone that slightly juts over your eyes, go with thinner brows so they don’t look too heavy over your eyes. Use an eyebrow brush to brush the hairs straight up. Brush them slightly in the direction they grow. You’ll immediately see some long, unruly hairs that need to be plucked. Pluck more hairs from the bottom of your brows to make them as thin or thick as you’d like. Do not over pluck. When you’re shaping your brows, take it slow. Step back and look in the mirror every few minutes to check your progress. Make sure you don’t pluck too much; eyebrow hairs can take 6 weeks to grow back, and sometimes they don’t grow back at all.